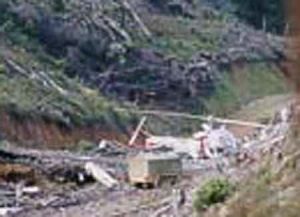 2001: Strzelecki Ranges Helicopter Spraying. Helicopter loading up for pesticide spraying of Australian Paper Plantatkions. 2001 Jeeralangs/Strzelecki Ranges. This entry was posted in Photos on December 2, 2016 by Anthony.